The mission of Family Focus is to promote the well-being of children from birth by supporting and strengthening families in and with their communities. We help parents gain confidence and competence as the primary caregivers and educators of their children. We provide parents and their children with critical resources and learning opportunities to encourage healthy development in their communities. We provide parents with training and educational tools to support healthy early childhood development. We work as partners, evaluating benchmarks and providing resources to meet the developmental needs of children. We connect parents to others in their community, creating a support structure that enables the whole family to positively impact a child’s emotional state, ability to socialize, capacity to learn, and preparation for school, for a lifetime of well-being. Family Focus supports children and youth ages 6-18 through enhanced educational opportunities programs to explore science, technology, engineering and math, as well as sports and cultural activities that encourage healthy development, self-confidence and the ability to create positive relationships. By helping parents, grandparents and family members achieve their own personal academic and career goals, we impact the lives of their children. Classes, support groups, and family events help caregivers gain skills and confidence. 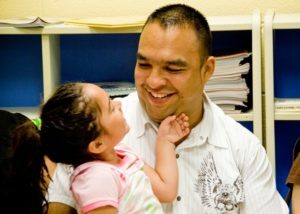 We begin in the home, one-on-one with participating families in the context of their cultural heritage and specific needs, and then connect parents with other parents and staff at the Family Focus center in their community offering classes, support groups and family activities.